Many of us love sports specially basketball and volleyball. Most Pinoy athletes are incline in these sports. And players of these sports eventually become a superstar, a heartthrob. But aside from these two sports, we are also a lover of music! Just like yours truly Runner Rocky, I'm also incline not only in running or marathons but also in basketball and in music! But what if your favorite athletes bring the sports and music at the same time?! Yes, two of today's favorite heartthrob players collaborate for sports and music! Ricci Rivero, the trending heartthrob basketball player and John Vic De Guzman, a volleyball team captain will join force this coming September for an exciting event! 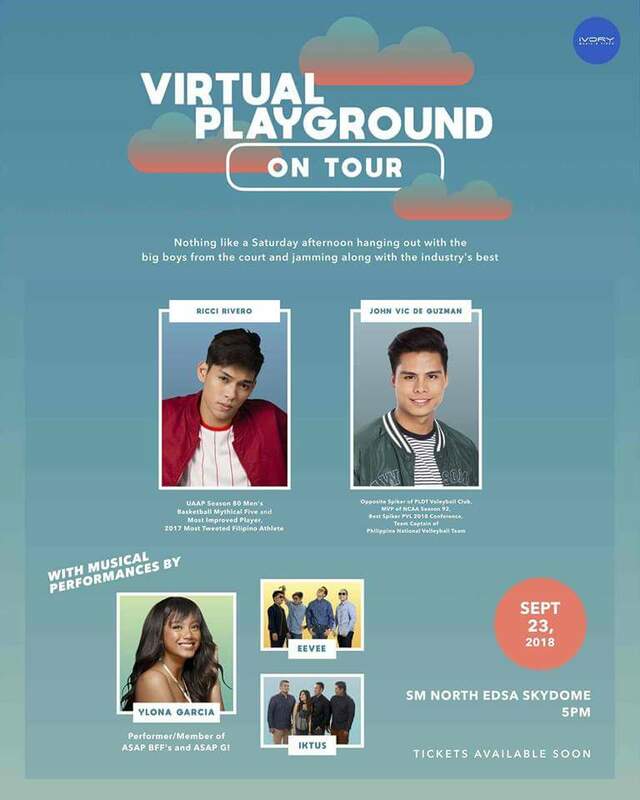 Ivory and Virtual Playground presents: Virtual Playground On Tour with Ricci Rivero and John Vic De Guzman. An afternoon to be spent with two of the Philippines' rising athletes at SM North EDSA Skydome on September 23, 2018 (Saturday, 5PM). Basketball, volleyball, and sports fans alike will have a chance to not only meet their heroes but to interact, play, and learn from them. What's makes it even better? You get to be serenaded by the ever beautiful and talented Ylona Garcia, Awit Award Nominee eevee, and the latest up and coming alternative pop-rock band iktus! Will You "Run With Me" This August 26? !